With a market presence of close to two years and counting, the Radeon HD 7000 series kept AMD afloat in the discrete PC graphics market. The company pretty much sat out 2012, probably focusing its efforts on getting its next-generation console chips right. 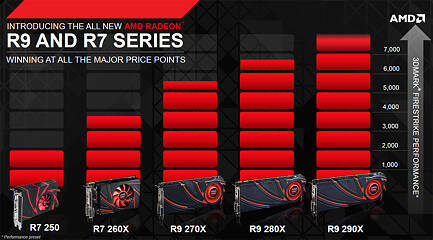 Come Q4 2013 and a product-stack update is long overdue for AMD. The company feels that the silicon it built its HD 7000 on is still fit for duty, provided that SKUs based on them are repositioned in the product stack much in the same way NVIDIA shuffled its with the GeForce GTX 700 series. Much like NVIDIA, AMD is going into its new generation with just one new chip it codenamed "Hawaii" while repositioning "Tahiti" and "Pitcairn" based SKUs one tier lower. The R9 290 series will succeed the HD 7900 series in the product stack, and the R9 280 series succeeds the HD 7800 series while the R9 270 series succeeds the HD 7700 series. Since such an arbitrary product stack repositioning would create unreal price-performance increments at the price points AMD launched its various HD 7000 series products, AMD tweaked pricing a little, so there really is a different and equally valid way of looking at AMD’s new product stack by using price points. 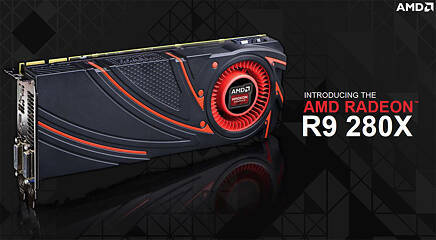 The Radeon R9 280X we have with us today is an interesting proposition for $299. It’s fundamentally identical to the Radeon HD 7970 GHz Edition from last year, but sells at a price that isn't too far off the $249.99 at which the Radeon HD 7870 debuted. Under the hood, the card is based on the same 28 nm "Tahiti" silicon that proved to be AMD's workhorse performance-segment chip for the better part of the two years. The Radeon R9 280X comes at an interesting time: DICE, publishers of the smash-hit "Battlefield" online multiplayer shooter franchise, announced that the recommended system requirements for the upcoming "Battlefield 4" prescribes graphics cards with at least 3 GB of video memory. That disqualifies the likes of the $410 GeForce GTX 770 and even NVIDIA’s flagship for last year, the GeForce GTX 680. Even though a very artificial requirement, it could still impact buyers psychologically, swaying them to buy either the R9 280X or the now $220-ish HD 7950. Based on the 28 nm "Tahiti" silicon, the Radeon R9 280X features 2,048 stream processors based on the Graphics CoreNext architecture, 128 texture memory units (TMUs), 32 raster operations units (ROPs), and a 384-bit wide GDDR5 memory interface holding 3 GB. AMD’s reference clock speeds for the chip are 1000 MHz on the core and 1500 MHz (6.00 GT/s effective) on memory, churning out 288 GB/s of memory bandwidth. Today, we have on the test bench the ASUS Radeon R9 280X DirectCU II TOP which comes with a new PCB and the same heatsink we've seen on the company's GeForce GTX 780 DC II. 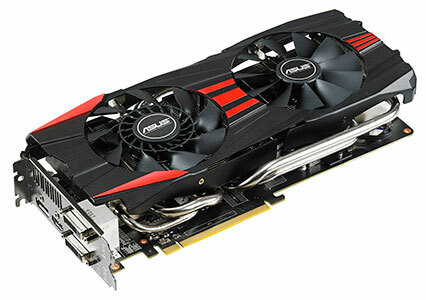 The card is currently available online for $310, which is only a $10 price increase over the reference design, making the ASUS R9 280X DirectCU II TOP quite affordable.